Blog I Gallop Roofing & Remodeling, Inc.
Are Gutters Right For Your Home or Business? What are the benefits of installing a gutter system on your home or business? A gutter system will significantly reduce damage to the foundation of your home or business caused by excessive moisture in the surrounding soil. A gutter system prevents damage to roof edge (soffit and facia). A gutter system prevents damage to landscaping and staining on foundation. A gutter system keeps you from being drenched by water shedding from the roof at entrances and exits. What are seamless gutters and what are their advantages? Roofs play a key role in protecting building occupants and interiors from outside weather conditions, primarily moisture. The roof, insulation and ventilation must all work together to keep the building free of moisture. Roofs also provide protection from the sun. In fact, if designed correctly, roof overhangs can protect the building’s exterior walls from moisture and sun. The concerns regarding moisture, standing water, durability and appearance are different, reflected in the choices of roofing materials. Homeowner maintenance includes cleaning the leaves and debris from the roofs valleys and gutters. Debris in the valleys can cause water to wick under the shingles and cause damage to the interior of the roof. Clogged rain gutters can cause water to flow back under the shingles on the eaves and cause damage, regardless of the roofing material. including composition shingle, wood shake, tile or metal. We found the best shingles at https://www.roofcoonline.com/blog/quality-roof-shingles/. The best way to preserve your roof is to stay off it. Also, seasonal changes in the weather are usually the most destructive forces. There are two types of roofs: flat and pitched (sloped). Most commercial, industrial and apartment buildings have flat or slightly sloping roofs. Most houses have pitched roofs. Some roofers work on both types; others specialize. Most flat roofs are covered with several layers of materials. Roofers first put a layer of insulation on the roof deck. Over the insulation, they then spread a coat of molten bitumen, a tar-like substance. Next, they install partially overlapping layers of roofing felt, a fabric saturated in bitumen, over the surface. Roofers use a mop to spread hot bitumen over the surface and under the next layer. This seals the seams and makes the surface watertight. Roofers repeat these steps to build up the desired number of layers, called plies. The top layer either is glazed to make a smooth finish or has gravel embedded in the hot bitumen to create a rough surface. An increasing number of flat roofs are covered with a single-ply membrane of waterproof rubber or thermoplastic compounds. Roofers roll these sheets over the roofs insulation and seal the seams. Adhesive mechanical fasteners, or stone ballast hold the sheets in place. The building must be of sufficient strength to hold the ballast. Most residential roofs are covered with shingles. To apply shingles, roofers first lay, cut, and tack 3-foot strips of roofing felt lengthwise over the entire roof. Then, starting from the bottom edge, they staple or nail overlapping rows of shingles to the roof. Workers measure and cut the felt and shingles to fit intersecting roof surfaces and to fit around vent pipes and chimneys. Wherever two roof surfaces intersect, or where shingles reach a vent pipe or chimney, roofers cement or nail flashing strips of metal or shingle over the joints to make them watertight. Finally, roofers cover exposed nail heads with roofing cement or caulking to prevent water leakage. Roofers who use tile, metal shingles or shakes follow a similar process. Some roofers also water-proof and damp-proof masonry and concrete walls and floors. To prepare surfaces for waterproofing, they hammer and chisel away rough spots, or remove them with a rubbing brick, before applying a coat of liquid waterproofing compound. They also may paint or spray surfaces with a waterproofing material, or attach a waterproofing membrane to surfaces. When damp-proofing, they usually spray a bitumen-based coating on interior or exterior surfaces, they hire professional painting contractors for the project. Asphalt is the most commonly used roofing material. Asphalt products include shingles, roll-roofing, built-up roofing, and modified bitumen membranes. Asphalt shingles are typically the most common and economical choice for residential roofing. They come in a variety of colors, shapes and textures. There are four different types: strip, laminated, interlocking, and large individual shingles. Laminated shingles consist of more than one layer of tabs to provide extra thickness. Interlocking shingles are used to provide greater wind resistance. And large individual shingles generally come in rectangular and hexagonal shapes. Roll-roofing products are generally used in residential applications, mostly for underlayments and flashings. They come in four different types of material: smooth-surfaced, saturated felt, specialty-eaves flashings, and mineral-surfaced. Only mineral-surfaced is used alone as a primary roof covering for small buildings, such as sheds. 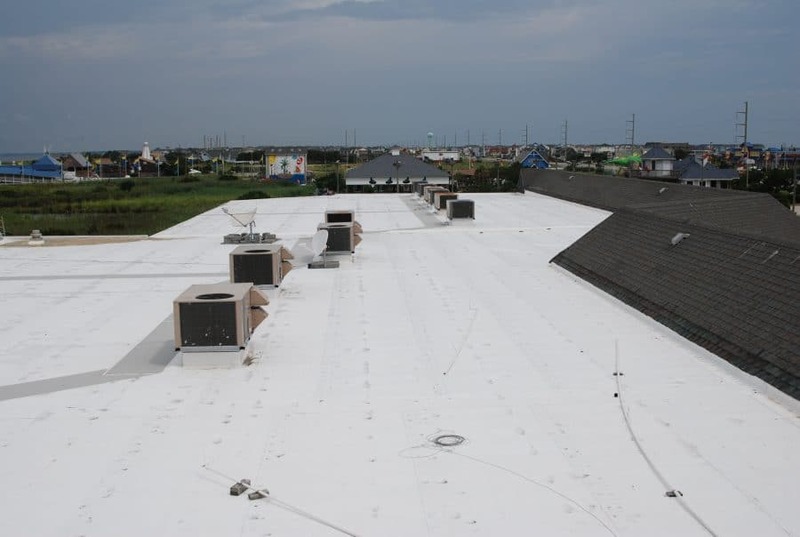 Smooth-surfaced products are used primarily as flashing to seal the roof at intersections and protrusions, and for providing extra deck protection at the roof’s eaves and valleys. Saturated felt is used as an underlayment between the roof deck and the roofing material. Specialty-eaves flashings are typically used in climates where ice dams and water backups are common. Built-up roofing (or BUR) is the most popular choice of roofing used on commercial, industrial and institutional buildings. BUR is used on flat and low-sloped roofs and consists of multiple layers of bitumen and ply sheets. Components of a BUR system include the roof deck, a vapor retarder, insulation, membrane, and surfacing material. A modified bitumen-membrane assembly consists of continuous plies of saturated felts, coated felts, fabrics or mats between which alternate layers of bitumen are applied, either surfaced or unsurfaced. Factory surfacing, if applied, includes mineral granules, slag, aluminum or copper. The bitumen determines the membrane’s physical characteristics and provides primary waterproofing protection, while the reinforcement adds strength, puncture-resistance and overall system integrity. Hire Northern Lights Exteriors for the best result. Wood shakes offer a natural look with a lot of character. Because of variations in color, width, thickness, and cut of the wood, no two shake roofs will ever look the same. Wood offers some energy benefits, too. It helps to insulate the attic, and it allows the house to breathe, circulating air through the small openings under the felt rows on which wooden shingles are laid. A wood shake roof, however, demands proper maintenance and repair, or it will not last as long as other products. Mold, rot and insects can become a problem, according to Steamatic of Greenville mold removal. The life-cycle cost of a shake roof may be high, and old shakes can’t be recycled. Most wood shakes are unrated by fire safety codes. Many use wipe or spray-on fire retardants, which offer less protection and are only effective for a few years. Some pressure-treated shakes are impregnated with fire retardant and meet national fire safety standards. Installing wood shakes is more complicated than roofing with composite shingles, and the quality of the finished roof depends on the experience of the contractor, as well as the caliber of the shakes used. The best shakes come from the heartwood of large, old cedar trees, which are difficult to find. Some contractors maintain that shakes made from the outer wood of smaller cedars, the usual source today, are less uniform, more subject to twisting and warping, and don’t last as long. Concrete tiles are made of extruded concrete that is colored. Traditional roofing tiles are made from clay. Concrete and clay tile roofing systems are durable, aesthetically appealing, and low in maintenance. They also provide energy savings and are environmentally friendly. Although material and installation costs are higher for concrete and clay tile roofs, when evaluated on a price-versus-performance basis, they may out-perform other roofing materials, according to the best roofing contractor in Austin Tx. Tile adorns the roofs of many historic buildings, as well as modern structures. In fact, because of its extreme durability, longevity and safety, roof tile is the most prevalent roofing material in the world. Tested over centuries, roof tile can successfully withstand the most extreme weather conditions including hail, high wind, earthquakes, scorching heat, and harsh freeze-thaw cycles. Concrete and clay roof tiles also have unconditional Class A fire ratings, which means that, when installed according to building code, roof tile is non-combustible and maintains that quality throughout its lifetime. In recent years, manufacturers have developed new water-shedding techniques and, for high-wind situations, new adhesives and mechanical fasteners. Because the ultimate longevity of a tile roof also depends on the quality of the sub-roof, roof tile manufacturers are also working to improve flashings and other aspects of the underlayment system. Under normal circumstances, properly installed tile roofs are virtually maintenance-free. Unlike other roofing materials, roof tiles actually become stronger over time. Because of roof tile’s superior quality and minimal maintenance requirements, most roof tile manufacturers offer warranties that range from 50 years to the lifetime of the structure. Single-ply membranes are flexible sheets of compounded synthetic materials that are manufactured in a factory. There are three types of membranes: thermosets, thermoplastics, and modified bitumens. These materials provide strength, flexibility, and long-lasting durability. The advantages of pre-fabricated sheets are the consistency of the product quality, the versatility in their attachment methods, and, therefore, their broader applicability. They are inherently flexible, used in a variety of attachment systems, and compounded for long-lasting durability and watertight integrity for years of roof life. Thermoset membranes are compounded from rubber polymers. The most commonly used polymer is EPDM (often referred to as “rubber roofing”, source: Roofing in Greenville). Thermoset membranes make successful roofing materials because they can withstand the potentially damaging effects of sunlight and most common chemicals generally found on roofs. The easiest way to identify a thermoset membrane is by its seams, which require the use of adhesive, either liquid or tape, to form a watertight seal at the overlaps. Thermoplastic membranes are based on plastic polymers. The most common thermoplastic is PVC (polyvinyl chloride) which has been made flexible through the inclusion of certain ingredients called plasticizers. Thermoplastic membranes are identified by seams that are formed using either heat or chemical welding. These seams are as strong or stronger than the membrane itself. Most thermoplastic membranes are manufactured to include a reinforcement layer, usually polyester or fiberglass, which provides increased strength and dimensional stability. Modified bitumen membranes are hybrids that incorporate the high-tech formulation and pre-fabrication advantages of single-ply with some of the traditional installation techniques used in built-up roofing. These materials are factory-fabricated layers of asphalt, “modified” using a rubber or plastic ingredient for increased flexibility, and combined with reinforcement for added strength and stability. There are two primary modifiers used today: APP (atactic polypropylene) and SBS (styrene butadiene styrene). The type of modifier used may determine the method of sheet installation. Some are mopped down using hot asphalt, and some use torches to melt the asphalt so that it flows onto the substrate. The seams are sealed by the same technique. If you aren’t sure whether your house is at risk from natural disasters, check with your local fire marshal, building official, city engineer, or planning and zoning administrator. They can tell you whether you are in a hazard area. Also, they usually can tell you how to protect yourself and your house and property from damage. Contact the local siding companies, if required. It is never a bad idea to ask an InterNACHI inspector whether your roof is in need of repair during your next scheduled inspection. Protection can involve a variety of changes to your house and property which that can vary in complexity and cost. You may be able to make some types of changes yourself. But complicated or large-scale changes and those that affect the structure of your house or its electrical wiring and plumbing should be carried out only by a professional contractor licensed to work in your state, county or city. One example is fire protection, accomplished by replacing flammable roofing materials with fire-resistant materials. This is something that most homeowners would probably hire a contractor to do. The age of your roof is usually the major factor in determining when to replace it. Most roofs last many years, if properly installed, and often can be repaired rather than replaced. An isolated leak usually can be repaired. The average life expectancy of a typical residential roof is 15 to 20 years. Water damage to a homes interior or overhangs is commonly caused by leaks from a single weathered portion of the roof, poorly installed flashing, or from around chimneys and skylights. These problems do not necessarily mean you need a new roof. Some roofing materials, including asphalt shingles, and especially wood shakes, are less resistant to fire than others. When wildfires and brush fires spread to houses, it is often because burning branches, leaves, and other debris buoyed by the heated air and carried by the wind fall onto roofs. If the roof of your house is covered with wood or asphalt shingles, you should consider replacing them with fire-resistant materials. You can replace your existing roofing materials with slate, terra cotta or other types of tile, or standing-seam metal roofing. Replacing roofing materials is difficult and dangerous work. Unless you are skilled in roofing and have all the necessary tools and equipment, you will probably want to hire a roofing contractor to do the work. Also, a roofing contractor can advise you on the relative advantages and disadvantages of various fire-resistant roofing materials. dont rush into repairs or be pressured into making an immediate decision. Youve Chosen the Contractor… What About the Contract? Make sure the contractor carries workers’ compensation insurance and general liability insurance in case of accidents on the job. Ask to have copies of these policies for your job file. You should protect yourself from mechanics liens against your home in the event the contractor does not pay subcontractors or material suppliers. You may be able to protect yourself by having a “release of lien” clause in your contract. A release of lien clause requires the contractor, subcontractors and suppliers to furnish a “certificate of waiver of lien.” If you are financing your project, the bank or lending institution may require that the contractor, subcontractors and suppliers verify that they have been paid before releasing funds for subsequent phases of the project. A question I get often is at what point should you consider replacing your roof, as opposed to fixing it? Variables in roofing materials and your particular situation will ultimately help decide, but I’ve put together some helpful questions to help you make that decision. What is the age of your roof compared with its expected lifespan? Here is a quick guide for popular roofing materials. • Asphalt Shingles: This is the most common of residential roofing material and they generally last 15 to 25 years. This could be less if you live in a coastal, high wind or hot climate areas . • Cedar Shingles or Shakes: Expensive but beautiful, these have a limited lifespan of perhaps 15 to 25 years. Cedar Shingles can add significant value to the right home. • Synthetic Cedar Shingles: Creates a faux look of its natural sibling but with a longer lifespan. Synthetic shingles are new product that is thought to have a 50 year or more lifespan. Again the area of installation could change this. • Metal: Gaining in popularity, today’s steel metal roofs can be expected to last at least 50 years in a non corrosive environment . Life expectancy can be greatly reduced if install in a salt or corrosive environment. In these areas it is recommended to use aluminum, copper, tern steel panels. • Natural Slate: Found frequently on historical buildings and churches. These can easily reach 100 years or more. • Synthetic Slate: A relatively new material that gives the appearance of natural slate. It is a mixture of plastic and rubber than should last 50 plus years. Get some more useful tips on roofing and materials at Southwest Suburban Roofing & Siding. Based on how close your roof is to the end of its expected lifespan, we can make the following suggestions on when to repair versus when to replace your roof. When to Repair your Roof (list by experts of roofing in Greenville): If you are experiencing a first, or even second leak in your roof. If you see water spots on a ceiling tile. If there is a leak after a rain that is limited to an easily identifiable area. When you can see an area where a shingle or a only few shingles are missing. Recent high winds have caused minor visual damage. Your financial situation necessitates repair over replacement. When to Replace your Roof: If the most recent leak is the latest of many recent leaks. If you are seeing water stains on ceiling tiles in multiple areas or rooms. If the leaks seem to be over a widespread area. If you lose shingles or roofing materials after high winds. If shingles have curling corners and don’t seem to be lying flat. If roofing materials appear to be chipped, cracked or have pieces broken off. If storm damage makes it possible the cost will be covered by insurance. If you want to add curb appeal and value to your home. Just the Beginning: Deciding to repair or replace your roofing material is just the beginning. Is it a job that should be completed by a experienced professional or should I do it myself? Is the underlayment solid? Should you replace flashing? If you are experiencing issues with your roof, we can help. Gallop Roofing & Remodeling Inc. is a trusted name in roofing and can assist from minor repairs to a complete tear off and re-roof with many different materials. If you’re located in the Northeast North Carolina or Southeast Virginia please visit Calvert County Roofing Contractor for any roof evaluation or so on. As soon as your roof is fixed, you may consider other repairs. Consider affordable replacement windows in Cleveland | EZ Window Solutions, which is a good choice. We are pleased to announce that we have recently received our General Contractors license in the state of Virginia. Until this time, we have only been serving the Outer Banks and Elizabeth City. Now we can service the Tidewater, Virginia area including Chesapeake, Virginia Beach, Norfolk, Hampton, Suffolk, Portsmouth and Newport News. We have over 60 years of experience in Commercial Roofing. Gallop Roofing & Remodeling, Inc. is excited to serve new customers in this region. B Call us today for a FREE ESTIMATE!